A mysterious master criminal, known only as Brenda, steals the crown jewels of Belgravia (not found on all maps) and Secret Agent X-9 is brought in to retrieve them. This serial does not have the cheesy fun of Flash Gordon, or the cool vigilante crime fighter panache of The Green Hornet. It is, however, a solid detective story with some interesting twists. Secret Agent X-9 was originally a comic strip written by detective novel writer Dashiell Hammett and drawn by Flash Gordon illustrator Alex Raymond in 1934. Although that creative team left the strip after a short period of time, X-9 ran in comic strip form until 1996. Recently BBC did a radio series of Secret Agent X-9 that starred Stuart Milligan and Connie Booth. In the comic strip, our hero started as a nameless agent in a nameless organization. He once referred to himself as Dexter and that is the name he is given in this serial. In the 40s the new writer decided it was silly for a secret agent to be always calling himself by his code name, so he named the hero Phil Corrigan. 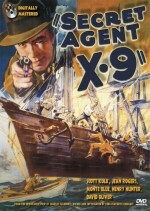 In 1945, Universal released a second serial titled Secret Agent X-9 staring Lloyd Bridges and Keye Luke. I’ll be reviewing that one next week. The serial Secret Agent X-9 has slightly better writing than most. In film serials the story and characters are usually very straight forward. Here, however, the theft of the crown jewels is only part of a larger plot to topple the Belgravian Monarchy. Unfortunately, they don’t delve deeper into that plot, but it does motivate Jean Rogers and Monte Blue’s characters: Shara and Baron Karsten. The two of them are the most interesting characters in this serial. For most of the chapters, you don’t know whose side they are on. Are they working with Brenda, with the agency, or do they have their own agenda? Can they even trust each other? Will one betray the other? These are questions you don’t usually get to ask when watching a serial. The agency also uses what would be at the time cutting edge forensic science. X-9 is able to capture Brenda by matching the bullets used in a murder to Brenda’s gun. It is also a darker serial than most. Brenda has a weasely mob lawyer getting his clients off on technicalities. Two of X-9’s fellow agents get killed. The first is X-9’s protégé, a young man on his first solo mission. The second victim comes as more of a surprise: he is a main character who gets shot in one of the last chapters. I say this in almost all of my reviews, but a good serial requires a cool villain. In Secret Agent X-9, the villain is interesting without being over the top. He is a master of disguise, which means he is played by multiple actors and you’re never sure who he is. For most of the serial, Monte Blue is playing a dual role as both Brenda and Baron Karsten. Our villain has multiple hideouts, with traps and secret passages. One of his hideouts is hidden on board a former-pirate-ship-turned-tourist-attraction. (The henchmen actually buy tickets to get into the hideout.) He is not the most memorable villain ever put on film, but he is effective. By serial standards Secret Agent X-9 is actually fairly ordinary. It doesn’t have rocket ships or a megalomaniac with a doomsday device. It doesn’t have a superhero or villain in a mask and a cape. There are no impressive, room-wrecking fights, or horse riding stunts. It does, however, have an above average script, and that makes it worth watching.